Clint is a special kind of guy - Texan through and through, a perfect drawl, tall, handsome, charming, with a constant stream of interesting stories. He knows his way around Michoacan thoroughly, and knows where to get the best meals, wh ether from restaurants or food carts. On the way down, as soon as our stomachs started rumbling, Clint pointed out a torta (sandwich) restaurant on the side of a dusty road, where we filled up on delicious quesadillas of cheese and avocado. Under the same awning was a car stereo store, and when I walked over to look at the stereos, a restaurant worker came in and asked if she could help me. Pretty efficient - the same employees work at both stores! We arrived in Patzcuaro, our destination, late afternoon. Patzcuaro is a lovely colonial town on a beautiful lake. 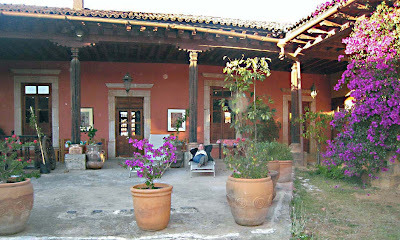 The hotel was a old hacienda with rooms around a central courtyard. 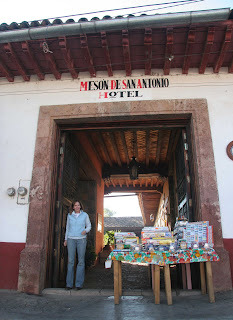 Patzcuaro is up around 8500 feet above sea level, so nights were cold. Carlos built a fire in the fireplace, but most of the heat went up the flue, so we had to huddle together for warmth. Next morning, we took off for the town of Tzintzuntzan, well known for its pottery. We were looking for Consuela, who has created a unique style of pottery that no one else does. Her normal spot in the market was vacant, so we asked where she lived, and wandered up a dirt road where, after a few inquiries, we found Consuela's home. The home was a series of brick rooms, some open to the weather, some closed. She lives there with, among others, her son, who recently lost his four children in a fire. She wasn't exhibiting this weekend because a batch of her work had cracked i n the kiln, leaving her nothing to show. She did have some plates, however, so Karen and Linda mixed and matched. She also had a lovely avocado tree in the yard, and we bought some for future eatin'. Leaving Consuela's home, we saw an unbelievable sight - a small horse lugging a load of firewood with a dog atop the load! While in Tzintzuntzan, we saw a small crowd in front of a lovely church. We walked over to investigate, and found a group of youngsters in costumes for Three Kings' Day. This is held on January 5, and is the day when Mexican's traditionally exchange gifts, rather than on Christmas Day itself. The children danced in the church as the priest blessed them and sprinkled them (as well as us with a smile) with holy water. On to another village - this time to a place where they make pots. We entered another world - dirt roads, mangy dogs, no restaurants, hotels or tourist attractions - a place virtually no American would bother with. We parked the car, and knocked on a door that Clint pointed out. Although it looked like every other door on the block, a smiling woman opened and invited us in. Children flocked around Carlos as he took pictures of them, spoke to them, and clowned around. Sadly, they were filthy and had bad teeth. But they were like children everywhere...smiling, laughing and having a great time, and generally oblivious to their poverty. 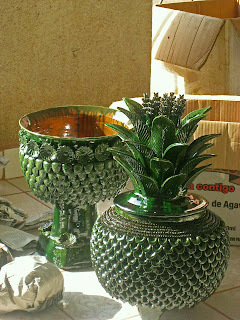 The lovely woman is one of the premier potters in Mexico. Her work is found in many books, museums and collections. 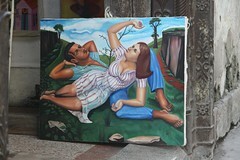 Yet she is modest and unpretentious, and her work is still inexpensive. We were certainly the only gringos in the town, and it was clear that they didn't get many visitors. Generally, they show and sell their work in other towns, and at annual fairs, like the one in Uruapan during Semana Santa (Easter Week). Some of them work virtually all year in order to have things to sell during this one week of the year! This is one of the artisan's houses we entered. Neat and clean, with dishes and glasses carefully stacked on the kitchen wall. But pitifully few possessions, compared to what we are used to. No running water, outhouses, etc. The toilet had a barrel of water with which to "flush". After some discussion, we decided to go on to the "Pineapple" village, where the local artisans make traditional pottery in the shape of pineapples, a traditional sign of welcome. Although most of the pineapples are green, some are brown. They range in size from a couple of inches to five feet! We were terribly hungry and thirsty after all this shopping, but fortunately Clint came through again! In a small town, at a roadside stand, he found some wonderful sandwiches and fruit drinks. The owners had been selling at the same location for 24 years. Four of their five daughters were living in California. Note the quail and chicken eggs for use in the fruit and vegetable drinks. Clint, Karen and I had giant Cubana sandwiches - meat, lettuce, avocado, onions, etc., while Linda had a vegetarian concoction, equally declicious. We had juice drinks made with oranges, pineapples, mangos and strawberries. Heavenly! The owners were so proud that they gave us a juice made with carrots and beets.